My hair used to be my big beauty problem until acne took over. During the time that my acne is difficult to control, I changed so many things in my regimen including my hair care products. I switched to natural hair care products hoping that it will hasten the improvement of my face but it didn’t only helped me with my acne problems, it improved the health of my hair too. The product I am referring to? 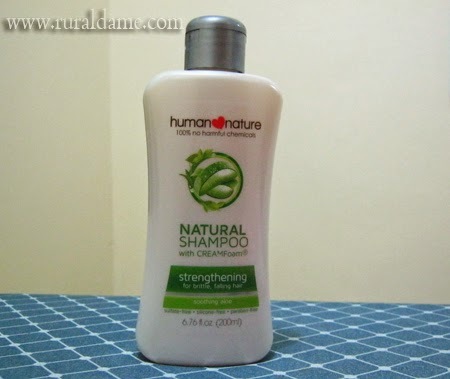 Its Human Heart Nature Shampoo and Conditioner from the Strengthening line. Since I have reviewed the conditioner months ago, I will only be reviewing the shampoo. Did You Know? Enjoying that foamy lather you get from chemical shampoos? It’s usually from chemical surfactants such as sodium lauryl sulfate (SLS) and sodium laureth sulfate (SLES). Sure, the lather feels nice but do you ever wonder what happens to all that foam after you rinse it off? It goes back into our rivers and oceans, where it is very toxic to the ecosystem. Packaging and Appeal. There is nothing special about the packaging of this conditioner. Just a typical bottle with images to reflect the image of the brand. The shampoo itself is light, almost watery. Effectiveness. During the first week of use, the shampoo (as well as the conditioner) doesn’t seem to be working and instead making my hair heavy, greasy and wiry. I almost wanted to give up but since I have no other option at that moment (most shampoos/conditioners are causing my dandruff), I forced myself to stick to it and I’m glad I did. A few weeks of continued use, I started to see improvement. My hair became more manageable and less frizzy and my scalp is no longer as itchy as before. It was like a eureka moment for me! I got the strengthening line hoping that it can help alleviate my falling hair problem but I see little improvement in this area. Maybe my hair fall problem is due to other factors such as stress and hormones. Price. The shampoo comes in 3 sizes; 50ml (Php 49.75), 200ml (Php 129.75) and 500ml (Php 299.75). The 200ml would often last me more than a month and considering what it does to my hair, I think the price is reasonable. Availability. Human Heart Nature products can be bought from Human Heart Nature branches, dealers and selected stores nationwide. I already did and will still do so. If you are looking into switching to natural hair care products, you may want to consider this one from Human Heart Nature. It is effective, smells good and friendly on the pocket. This shampoo eventually made my scalp itchy when used daily over a period of time. I no longer use this daily but in alternate with Milea Tea Tree Shampoo.